There were many reasons why my excitement levels were reaching fever pitch when we moved into our new house together over 10 years ago. It was the first home we had bought together although we’d lived in one together before that and we both loved the style and period of the house. In the 10 year period between being 18 and 28 I had lived in 15 different houses. Most of them rented, some during my University days and then subsequently during my first proper job in London. Once I moved to Nottingham we tried several areas and several rented houses before finally buying our own. With my partner at the time this house was a modern 3 bedroomed new build, and whilst being ours it didn’t have much character or personality and felt very small at times. Fast forward another 5 years and I was thrilled to be moving into a Victorian-semi built in 1895, simply oozing with character and original features. Well ok, it was also oozing plenty of woodchip wallpaper, nasty carpets and badly built in 1970’s wardrobes but it was ours and my interior design brain was kicked into overdrive. We had big plans, thankfully backed up with some left over equity from the previous houses, and we set to work almost immediately transforming this unloved, tired house into our dream home. One of the first rooms we tackled was the living room. The walls were covered in a mixture of woodchip and shiny embossed green wallpaper. The fireplace was an old fashioned gas fire sat on a huge marble plinth. It wasn’t a good look. A badly made boxed in seating arrangement in the gorgeous bay window was the first thing to go, although the cats did love sunning themselves there. Although there were many things I didn’t like about this room, the one feature I loved was the original wooden exposed floorboards. I’d longed for a room with real floorboards and was determined that this one feature we were going to retain. The dining room and hallway were the same, real floorboards exposed in all their glory, in need of some tlc, but basically sound. We had moved in during March as the weather turned better and Spring was well and truly on the way. With better weather it seemed natural to move our DIY outside and start working on some outdoor projects during the summer. The living room was taking shape though, as was a mini makeover on the bathroom and woodchip wallpaper stripping in the hallway. It was only as the year moved forward and Summer turned to Autumn and then Winter that we realised the one major downfall of original wooden floorboards. The howling, whistling wind that rattles through them at all times of the day and night, turning a cosy room into an ice box. No amount of insulation seemed to make any difference and several Winters later we abandoned our original flooring in favour of some Carpetright laminate flooring from our local Carpetright store. A few years ealier this would have been such a difficult decision for me, but not being the warmest girl in the world and with babies now also occupying our home, practicality took over. And quite frankly it was the best flooring decision we’ve ever made. Laminate flooring now comes in all kinds of colours and finishes and browsing the Carpetright website I’m very much in love with white laminate! Again, I’m not sure how practical this might be with children around (I do love that oak laminate really doesn’t show many marks or dirt) but it looks divine and it’s on my virtual wishlist. The laminate flooring in our dining room and kitchen takes a real battering but still looks very good after about 8 years’ wear. It takes very little looking after (unlike the original floorboards) and is really easy to keep clean. 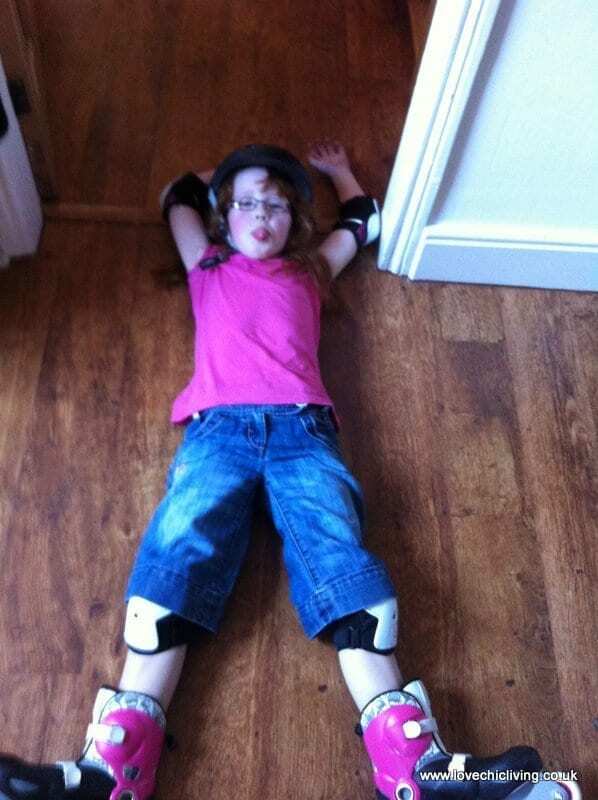 As you can see from the picture, it’s also amazing for roller blading when you are 8 and not allowed to go out on the streets!